West Virginia’s great theater venues offer outdoor performances in beautiful surroundings, while others take place in historic landmark buildings that will bring you back in time. Others provide those perfect acoustics, bringing the productions to life with sound. No matter what type of venue appeals to you, you can’t go wrong visiting any of the choices here. Support the arts on a cultural and social level at these 10 great places to see live theater in West Virginia. Deep in the heart of the Appalachian foothills, Gandy Dancer Theatre in Elkins, West Virginia, delivers an exciting and high-energy theater experience for young and old alike. Audiences will delight to the foot stomping music of the Mountain State that includes anything from 1950s oldies to bluegrass and gospel. The theatre can accommodate up to 500 people and provides a one-of-a-kind venue for family entertainment that can’t be found anywhere else in the state. Visitors can stay in the Isaac Jackson Hotel and eat at the 1863 Grill, both within walking distance. Take a trip around the globe without leaving your seat at the Greenbrier Valley Theatre in Lewisburg, West Virginia. You can travel from Berlin to New England to London and back again through the living performances, musical events, and other productions held here. For over 50 years, the theatre has been entertaining audiences with top-notch and award winning shows to bridge art and life through performance. The Clay Center for the Arts and Sciences of West Virginia in Charleston is more than meets the eye. With a 240,000-square-foot auditorium, the center also includes a planetarium, renovated theater, and a climbing sculpture. Supporting and promoting fine arts, science, and music and theater performances, they also offer a wide range of comedy and dance expression to the delight of those attending. There’s so much to do and see here, the only problem will be deciding on what. If you want entertainment without compromising family values, then you want to attend a performance at the American Mountain Theater in Elkins, West Virginia. 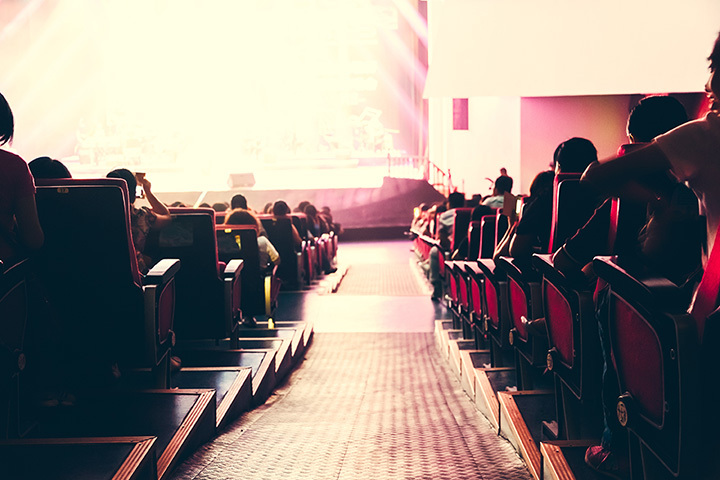 Featuring award-winning bluegrass and gospel music with groups like the Kingsmen Quartet, Mark Lowry, Larry Gatlin, and Quicksilver, the theater also offers concert series tickets if you just want to keep coming back for more. Open since 1969, the Lyell B. Clay Concert Theater, part of the Center for Creative Arts, is an extension of West Virginia University and is located in Morgantown. Being part of such a large university allows a wide variety of events here that include sports, music, and live theater. The popular “Mountain Stage with Larry Groce” has been performed live here for over 30 years and has been featured on National Public Radio on more than 150 radio stations in the U.S.
Seeking to promote and teach West Virginia history, Theatre West Virginia in Beaver, West Virginia, was formed to share the Mountain State’s unique place in history while entertaining audiences. “Honey in the Rock,” a dramatic outdoor presentation about the Civil War, was first performed in 1961 and the beautiful New River Gorge is the perfect backdrop for the annual show. If you want to experience a Broadway play without going to New York City, then you want to attend a performance at West Virginia Public Theater in Morgantown, West Virginia. In a newly-renovated theater in the downtown area, audiences can continue enjoying the same professional live theater shows they have for more than 32 years. Hosting classic movies like “The Princess Bride,” Orwell’s 1984, and the newer Harry Potter cult classic series, the Raleigh Playhouse and Theater in Beckley, West Virginia, also offers live performances in music and theater. The theater is at the heart of a cultural revolution that’s occurring in the surrounding area to reclaim and spread performing arts throughout the area. If you like being up close and personal with performers, then this is the place for you. The Shepherdstown Opera House in Shepherdstown is a small, but definitely worth-the-trip kind of place. Although the seats are a little worn, there’s a feel of stepping back in time and they have the best popcorn around! Whether you’re there to watch a movie during the American Conservation Film Festival or one of their live performances, you won’t be disappointed in the entertainment value. They even rent the opera house for special events. The original home of Jamboree USA and the current venue for the Wheeling Symphony Orchestra, the Capitol Theater in Wheeling, West Virginia, is the largest theater in the Mountain State. A classic landmark with the Victorian architecture, the theater sits at the edge of the Ohio River not far from the historic National Road Suspension Bridge and the state’s first Independence Hall.